Today we will touch on a very important topic, the main purpose of which is selection of kitchen table and countertops. We will try to make emphasis on the functionality and the specific characteristics of the kitchen furniture, using an individual approach. First of all, we define the diversity represented by IKEA. Countertops - the main participants of the "culinary wars"
So, №1 item - countertops. They tend to take on the basic "strike" during cooking. There has to be a place and high temperature, and various dirt, mechanical impacts on the surface. Therefore, every woman wants to selected countertop was reliable and moderately "hardy". For the most demanding IKEA produces countertops even steel - SANFRID. The main difference countertops from the dinner table is its immediate purpose: it prepare all the necessary ingredients, and it has also put cooked food, "with heat from the heat." 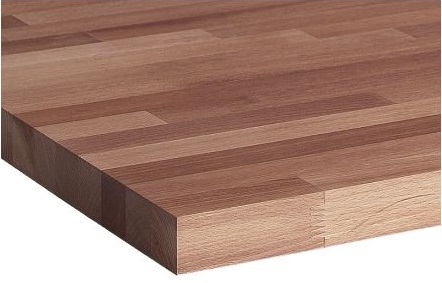 In addition, worktops performed also aesthetic function, particularly if they are made of wood. However, they need to choose not only in terms of beauty and appearance of the material, but also on the basis of functional characteristics. Therefore it is necessary to take into account everything, even the possibility of installation of kitchen equipment built into the countertop. Go to step №2: all about the dining table, the benefits of the choice of material and other useful subtleties. The tree is always a price! 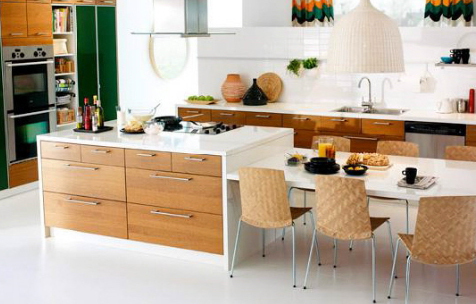 Wooden kitchen tables IKEA will last you long life, as during their production, they are subject to special treatment. However, we must not forget that even the most expensive tree requires a certain amount of time for the care. 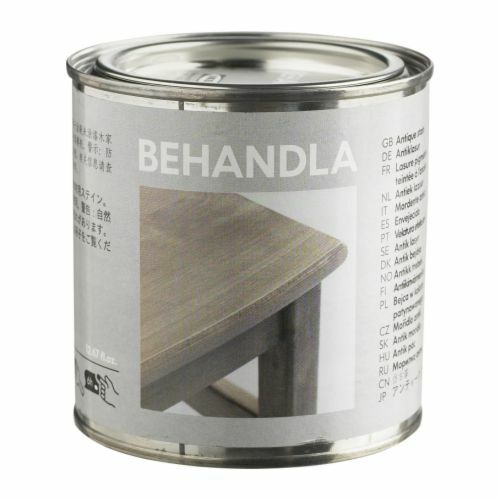 If you really want to extend the life of a wooden table top, it is particularly important to handle it with special oil material - BEHANDLA. By the way, this procedure would not hurt to take place immediately after the installation of the kitchen table. So you can effectively protect the surface of the kitchen table from excessive moisture, stains and mechanical damage. Before treatment is recommended to polish wood using fine sandpaper. The leader among these models is considered to be a model NUMERER. This kitchen table can be as one-sided and two-sided. By the way, for kitchens dark tones perfect table made of beech wood is dark brown. Countertops Girton и OKERBI also made of natural wood (beech and oak array, respectively). However, most often found at IKEA countertop made of MDF, particleboard or fiberboard and veneer coated with acrylic paint. This model tops LINNMON (DVP) TORNLIDEN (Pine veneer) HISSMON (MDF) GALANT (EAF). Laminate: always ready for testing! laminated tables are the following categories. Note that all of laminate countertops are thoroughly tested. They can withstand Not only exposure to high temperatures (up to 180 degrees), but also hinder the absorption of liquids such as wine or rasteksheysya spilled oil. Kitchen tables IKEA laminate is very easy to keep clean. Among these countertops positively proven models PREGEL. And its color gamut allows harmoniously enter into any kitchen interior. Model LAGAN also made of the laminate. Despite the strength and durability of modern laminate manufacturer warns that any experiments, for example, a hot frying pan without stand or cleaning sponges with abrasive surfaces can lead to irreversible consequences. A reservation that there are countertop made from stone and acrylic. Unfortunately, these countertops we IKEA catalog pages found. And for good reason: the degree of resistance of acrylic is several times higher than that of the laminate. But, following the policy of "budget" IKEA for buyers, of course, no acrylic or stone countertops, here "do not fit". Another amazing option countertops are made of tempered glass - GLASKHOLM. However, we note that the glass - a material brittle, despite the strength of tempered glass, sometimes there are unpleasant incident. Also, the glass requires some care, if you want to make it look decent and neat. But with careful care of glass countertops are pleasing to the eye and will last for many years. Countertops MALM also produce tempered glass. This brings me to the last point, №3: desks, cabinets. In the catalog IKEA they can still be referred to the cart, but it does not change their functionality. IKEA kitchen tables can be also multi-functional, if they are equipped with additional shelves for any necessary details in cooking. So, tables, cabinets are convenient in that they can be integrated harmoniously in the kitchen interior, as well as significantly save even the smallest space in the kitchen. 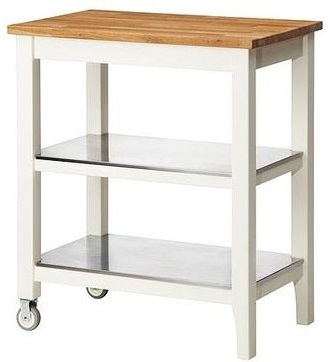 Very often, this piece of furniture is already built into the ready-made models of IKEA kitchens. Often they are equipped with a sink. It turns out that such a kitchen table contains everything that is necessary for each housewife, while not particularly heaping the overall interior of the kitchen. As a rule, the doors of such tables are removable, which allows you to constantly keep the furniture in perfect cleanliness. A pleasant surprise for housewives was the fact that spacious kitchen tables became even more mobile due to the appearance of wheels. They can be freely moved throughout the kitchen. Moreover, these mobile tables can not only keep all your kitchen utensils safe and sound, but also ensure free access to it, thanks to special hooks. The main models of this wonderful furniture are called GRUNDTAL, clasp, DRAGGAN, Klas, MOLGER и HELMAREN. Typically, the above tables because their mobility is also called "cooking islands". They are able to please you not only for its ease of use, but also very unusual for a table design. And there really is to choose which of the Model BEKVEM и STENSTORP made both from metal and wood. The color palette is the latest model to be found echoes of very fashionable style in 2014 year - «contemporary». It combines light and dark shades, which allows him to acquire a certain ease and brevity in the performance. If the kitchen stand in a similar style, then any additional decoration for the kitchen you just do not need.